Joel’s note: This is a guest post by Krizia the co-creator of The Blog Income for Women Blueprint. if you want to write a guest post for BTG please contact me here. The first type of blog is really about pure expression and creativity and most people who operate personal blogs aren’t in it for the money. Magazine type blogs usually are driven by ad revenues. Because they have a lot of content, they are able to drive a large number of readers each month and they are therefore able to get a lot of money from advertisers and sponsors. Review blogs are fueled by affiliate commissions. A review blog is a blog where you write a clever review which you link to an affiliate product and then you do tones of marketing in order to get as many people as possible to your page in order to convert them to your affiliate offer. Most newbies to blogging will find that the experience of blogging without revenues is nothing more than a hobby and if they are looking for additional revenues, the idea is really to learn how to write reviews on their blog that will convert into blog income. Writing reviews might seems a bit daunting at first, but there are some simple rules you can follow to ensure you write the type of review that grabs readers’ attention and most importantly, get your readers to take action. 1) Your title is important: If you are reviewing a product, you’ll want to be sure to add the product name in the title. Cute titles are cute, but if you want conversions, people NEED to know what you are featuring. 2) Repeat the name of the product you are reviewing: You’ll also want to make sure to repeat the brand name of the product you are reviewing at least two to three times in the body of your review. This will make it a lot easier for the search engines to rank your review. 3) Do research: You’ll want to spend some time doing research online to see what others are writing about the product you want to review. This is a great way of gathering insightful tidbits that you can use in your own reviews! 4) Include testimonials: If you do research, you’ll undoubtedly find testimonials on the product you want to review. Adding a few testimonials is a great way to enhance your review. 5) User photos: Photos are very important when writing review posts. If you are writing a product review that you got from an affiliate program, chances are that you’ll already have access to a bank of photos or banners. “Click here to find out more about this product: [Name of product you are reviewing]”. Becoming proficient at writing review posts can seriously pay off in the long run because a good review post can become extremely profitable. When it comes to blogging, you’ll want to figure out early on what type of blogger you want to become. I know if my case, it took me a long time to realize that being a review blogger was far easier and more profitable than operating a magazine blog. Unless you have serious traffic, advertisement won’t really pay off for you, but a review post only requires targeted content that will attract the right type of visitors looking for the products you are featuring! In my experience, I’ve managed to write review posts that pulled several thousands of dollars over a couple of weeks. In a few minutes, you can craft the type of post that keeps bringing in some interesting blog income … it’s a matter of knowing how to write a good review post and having the right formula to market your post! I’ve made no secret of the fact I love the Disqus commenting system plugin. However each time I upgrade it I have to go through the same rigmarole of changing the plugin due to one specific problem. So this will explain how I fix the View Comments problem in the Disqus plugin for WordPress. The 44 text is displaying perfectly on the Blog, category and archive pages. However on the single post page by default instead of the comment count it says View Comments and is cut off, as you can see below. There, looks lovely again. This isn’t really a bug as it’s designed to say View Comments there, however in the default WordPress comment system this would show the number of comments here, so we are simply re-creating that functionality. 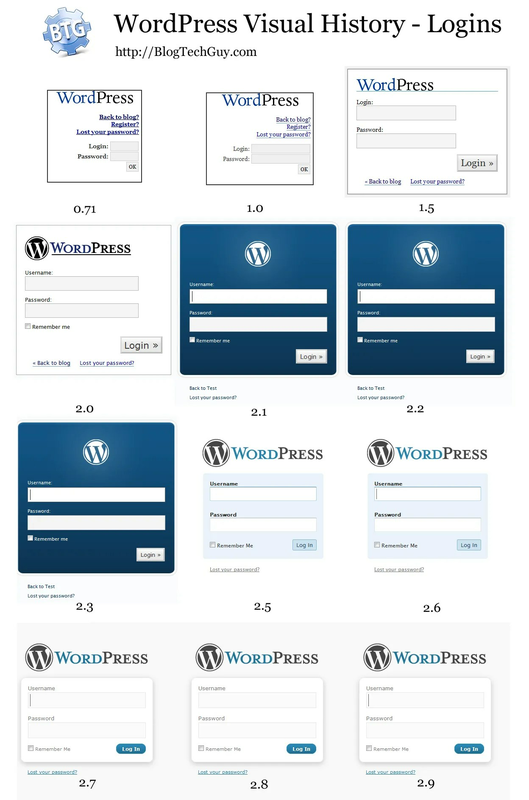 I thought I would take a look at how WordPress has changed over the years. For no reason, except because sometimes I can be an incredibly boring man. Over 5,500 files and 13 major releases of WordPress later, I’ve put together a video and some images of the changes to the WordPress login screen and initial page once logged in (now the Dashboard, but used to be the Write screen). I was only unable to get version 1.2 working, though I didn’t try very hard to be honest. A brief summary of the different versions of WordPress are listed below. To all geeks like me, enjoy! After my visit to BlogWorldExpo in Vegas a week or two back I was impressed with a couple of different blog applications, and so have installed them on my Blog, and thought I’d mention them. You may have noticed that all my blog posts had 0 comments for a few days. This was while the team at JS Kit imported my old comments into their system. Used by sites such as Technorati and Guy Kawasaki it essentially pulls in other places where your blog post is being talked about into your blog posts comments. This keeps your blog as the central hub for your online activity, which appeals to my sense of neatness adn order! So Twitter tweets that mention your post, Diggs, or Friendfeed updates are added to your post comments. Facebook doesn’t seem to be on there yet but I’m hoping that will be added soon. Give it a try below in the comments and see what you think. I’m still playing with it but it looks good so far. It costs $12 per year to use, and I was a little disappointed in how long it took for them to import my comments – 6 days. I did provide them with the wrong URL to login (oops), but over 24 hours for each email reply and no reply over a weekend is frustrating for a new customer. The second addition is the lijit search. I had a great demo from Perry Quinn at Blog World, their plugin essentially replaces the standard WordPress search sidebar widget. The search results are similar in a way to JS Kit in that they also show results from my extended network. So Twitter, YouTube, StumbleUpon and various other sites are also searched and relevant results displayed in a Content tab on the results page. It’s at the top right of each blog post page so give it a go and see if the results work for you. I’m not 100% it’s all working yet. Although I would turn them off if I could, the ads that appear on the results page are part of a revenue share, so if you’re looking at earning some money on your blog it may be worth giving lijit a try. As always, I’m interested in your comments so please let me know what you think below. Are You Scared of WordPress 2.7? Yes, the interface to WordPress “just” changed and very soon it will be changing again. However I personally believe they have done the right thing – the myth of the ease of blogging is gradually becoming a reality. The WordPress team have released a new video (embedded below – click here if you can’t see it) very quickly showing you a fraction of the new features (many of which have been available via plugins for a while) many of which I’m excited about. The new menu feature is worth it alone. Weblog Tools Collection has further details and a great list of links to answer more of your questions. You can also check here to see if you host can run WordPress 2.7. Posted on November 11, 2008 Categories Blogging, Blogging SystemsTags 2.7, wordpress4 Comments on Are You Scared of WordPress 2.7?